Top Rated Propane Grills Of 2017 – For Mouthwatering Outdoor Cooking At It’s best! Make Drool-Inducing Grilled Food In Your Own Backyard With These Top Rated Propane Grills for 2017. We can all agree that a successful backyard cookout party starts with a good grill to cook on. However, finding that good grill can be a daunting task. With so many models and designs to choose from, it’s easy to end up with the wrong grill for your needs. These top rated propane grills will help you narrow down your choices. 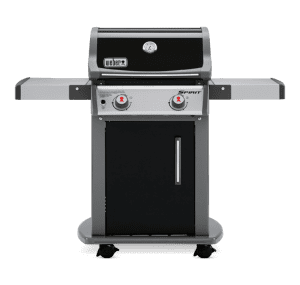 If you are new to propane gas grills and haven’t read my overview on them yet, you might want to start by reading “What Is A Propane Gas Grill? – An Introduction To Outdoor Propane Gas Grills”. There are a head-spinning amount of gas grills available with prices ranging anywhere from under $200 to over $4,000. From the big named brands like Weber, Char-Broil, and Napoleon to the more generic type grills that pop up in the local grocery stores every spring, there are hundreds to choose from. Propane gas grills range in size with each additional burner expanding your cooking capabilities. Many smaller 2 and 3-burner propane grills will be the perfect size for homes with limited space (think apartments or townhomes) or smaller families. On the opposite side, a 5-burner propane grill can give you enough room to cook for an entire block party or big family cookout. Options such as size (additional burners) and added cooking features will affect the price range, though. While cheap propane gas grills can and will cook your food, if your grill does not get hot enough or retain heat well, your food will not cook as evenly and can take longer to cook. That’s not to say that is the case for all low priced propane gas grills, but you usually get what you paid for. Do you really want to take the chance of serving overcooked and dried out meat at your next fantasy sports draft party or family reunion? The majority of low-end, low-cost models cannot get hot enough for searing steaks or other meats. This is where grills with the added special sear burners come into play. In my opinion, out of all the possible accessories, a good sear burner is the most important. Many other accessories are convenient and great to have, but without a good built-in sear burner capable of reaching blazing high heats, you will never get that crusty, seared in goodness from the standard burners. While a higher quality grill may be more expensive at the start, they are made sturdier and from better materials. They will cook better, last longer and produce better results with fewer frustrations from bad grilling experiences. How often do you plan to use your grill over the course of a typical year? How many people do you expect to cook for on a regular basis? Do you need a model that can be easily moved or transported? How long are you expecting your grill to last? Regardless of the price range you fall under, the internal temperature gauge thermometers built into the hoods are always low quality and inaccurate. They are routinely off by as much as 50°F. That is why I always recommend a good digital meat thermometer that includes a probe that can be placed on the cooking surface for accurate temperature readings. 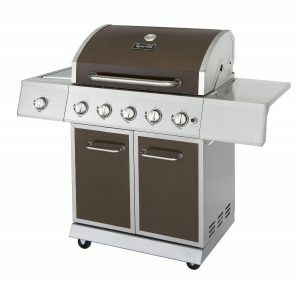 So on that note, I have put together a list of the highest rated propane grills for 2017 with an overview of each to help you find one that’s the best fit for your budget and needs. I have split the ratings into four categories starting with low-cost gas grills and ending with ultra high-end luxury gas grills. The below grills are the more durable, solid and are proven choices for this price range and make a decent choice for casual backyard grilling. Keep in mind, you get what you pay for, so don’t expect these grills to be built for the long term or to cook extremely well. These types of grills are considered disposable grills. It is not worth buying replacement parts to fix a grill in this price range. They should serve for 2-4 years and do a decent job of grilling burgers, hot dogs, and ok steaks. 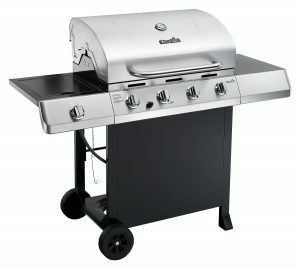 Char-Griller 3001 Grillin’Pro Propane Gas Grill weighs in at 88 pounds with a 630-sq in total cooking area. This is enough room for up to 28 burgers. It is made from durable steel and has conveniently attached wheels for mobility. The grill kicks out 40,800 BTUs and the side burners offer another 12,000 BTUs. 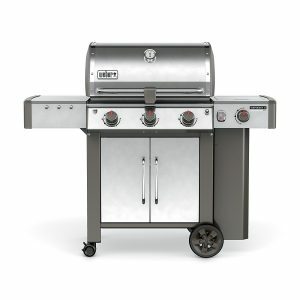 Char-Broil Classic 300 2-Burner Gas Grill weighs in at 86 pounds with a 420-sq in total cooking area. It is made of durable porcelain-coated steel with non-stick porcelain-coated cast iron grill grates. The grill produces 30,000 BTU’s and has additional storage space. Metal side shelves conveniently fold down to easily store the grill. Dyna-Glo DGB390SNP-D Smart Space Living 3-Burner LP Gas Grill weighs in at 98 pounds with a 503-sq in total cooking area. This is enough room for up to 20 burgers. The durable double-wall stainless steel lid assembly is designed to retain heat. It has conveniently attached heavy-duty wheel casters for mobility. 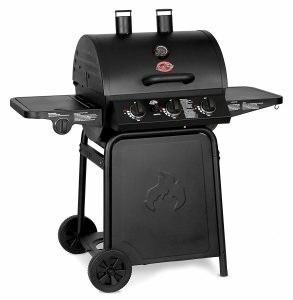 An electric pulse ignition activates the burners, which are controlled by three dials to customize the heating temperature for your specific needs Metal side shelves conveniently fold down to easily store the grill. 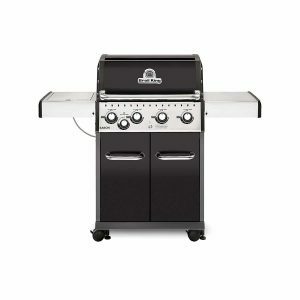 Char-Broil Classic 40,000 BTU 4-Burner Gas Grill weighs in at 96 pounds with a 660-sq in total cooking area. This is enough room for up to 30 burgers. The four primary burners generate up to 40,000 Btu and also features a 10,000-Btu, flush-mounted side burner with a convenient cover. The electronic ignition allows quick startup of all the burners. Perfect for larger families or cookouts it includes an electronic igniter and wheels for mobility. Porcelain-coated cast iron cooking grates, a 430 stainless steel body, powder coated steel and cast aluminum parts round out the construction of this grill. 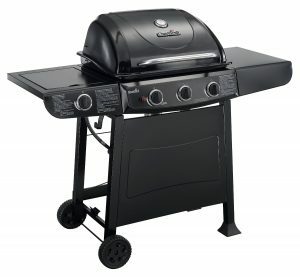 Char-Broil Quickset 3-Burner Gas Grill weighs in at 65 pounds with a 530-sq in total cooking area. This is enough room for up to 22 burgers. Perfect if you are looking for a smaller grill that still packs a punch. The four primary burners generate up to 36,000 Btu and feature a 12,000-Btu, flush-mounted side burner with a convenient cover. Features include porcelain-coated steel lid and firebox, piezo push-button ignition and built-in temperature gauge. It also features porcelain-coated wire cooking grates and 6″ wheels allow easy movement. The three burners have independent controls, and the flame is started via the piezo push button ignition. The below grills are the more solid and proven choices for this price range and make a good choice for more well-designed, responsive and durable grills. It doesn’t matter how powerful a grill is. If it isn’t well constructed with quality material, and can’t distribute and hold heat well, your food is going to suffer. While a basic grill is fine for cooking burgers and dogs, if you are looking to cook delicate fish and steaks with mouthwatering sear marks, you’re going to need a grill that can step its game up. 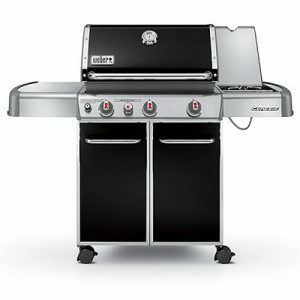 Weber Spirit E-310 3-Burner Gas Grill offers 32,000 BTU-per-hour input for the main burners with a 529 -sq in total cooking area. This is enough room for up to 22 burgers. A handsome and solidly built grill that we have come to know and love from the Weber brand, you can expect it to last up to seven or eight years or so without any major problems along the way. More than just a thin stainless steel/paint finish, this is true steel. Even the control knobs for this grill are stainless steel. Another great thing about this grill is that many of the extra bells and whistles come standard with this Weber. One of my favorites is the propane-measuring gauge. It helps to know the exact amount of propane left in the tank to keep you from an embarrassing mistake. 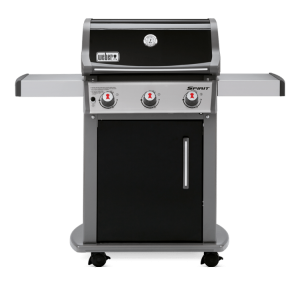 Weber 46110001 Spirit E210 Liquid Propane Gas Grill weighs in at 128 pounds with a 450-sq in total cooking area. This is enough room for up to 18 burgers. The two main stainless steel burners are durable with up to 26,500 total BTU per hour input delivering powerful heat and performance. The porcelain-enameled cast-iron cooking grates produce superior heat retention and easy cleanup. The two stainless steel fold-down tables allow for easy maneuverability and storage. Perfect for grillers with small decks, balconies or patios. The grill also provides porcelain-enameled Flavorizer bars, a center-mounted thermometer, an enclosed cart, and a porcelain-enameled shroud, which means no fading, peeling, or rusting to worry about. Other highlights include six tool hooks, two heavy-duty front-locking casters, and two heavy-duty back swivel casters. Char-Broil Classic 6-Burner Gas Grill weighs in at 132.5 pounds with a 650 square inches of primary cooking area plus 250 square inches of secondary cooking on the swing away warming rack. This is enough room for up to 30+ burgers and grill for the whole neighborhood. The six metal burners offer up to 65,000 BTU with a 10,000 BTU lidded side burner. The porcelain-coated grates are designed for durability and easy cleaning and the cabinet and side shelves give grill masters space and storage needed to make their masterpieces. The convective cooking system is great for grilling and indirect cooking at low temperatures. Just close the lid and you’ll get even heat and low flare-ups. Two of the grill’s four wheels are locking casters, making the grill easy to move and stable once you’ve locked the wheels in place. Dyna-Glo 4 Burner, LP Gas Grill offers 48,000 BTU-per-hour input for the main burners with 12,000 BTU lidded side burner and a 667-sq in total cooking area. This is enough room for up to 24 burgers. 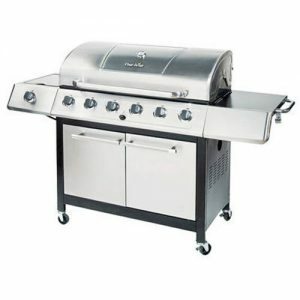 This grill boasts a commercial Stainless Steel finish that is durable and easy to clean. The lid is double-walled to minimize heat loss and improve the cooking efficiency of the burners. The Dyna-Power cooking system features a steel, double-wall firebox with a track record of long-lasting products. 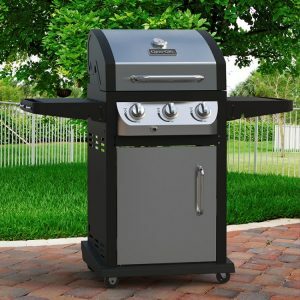 Further lending to the grill’s sleek design is a cabinet assembly that includes two side-by-side stainless steel, double-wall doors and four multi-directional (two locking) casters that allow you to easily relocate the grill. 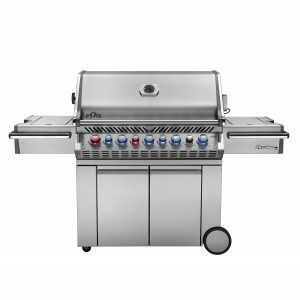 Dyna-Glo DGE Series 5 Burner Gas Grill offers 50,000 BTU-per-hour input for the main burners with 12,000 BTU lidded side burner and a 708-sq in total cooking area. This is enough room for up to 28+ burgers. The handsome stainless steel and high-quality Burnished Bronze metallic powder coat finish offer easy maintenance and long life. Dyna-Power cooking system features a steel, double-wall firebox that houses five stainless steel burners. The durable lid construction is highlighted by a double-wall liner to retain heat and improve the cooking efficiency of the burners, along with heavy gauge, steel end caps for stability. With the simple push of a button, the power of this gas grill takes charge, and you’re only minutes away from enjoying juicy burgers, succulent steaks, evenly cooked chicken and much more. Broil King Baron 440 Liquid Propane Gas Grill weighs in at 150 pounds with a 644-sq in total cooking area. This is enough room for up to 28 burgers. The four stainless steel Dual-Tube™ burners deliver up to 40,000 BTUs, heating the grill quickly and evenly. Made from high-quality stainless steel and backed by a 10-year warranty. 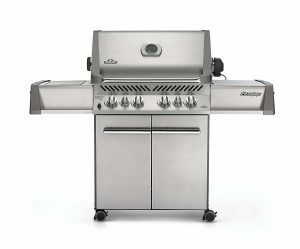 A 10,000 BTU commercial-grade side burner offers more grilling versatility. Reversible heavy-duty cast iron cooking grids deliver unrivaled searing performance. One side is pointed to give you perfect grill marks, while the other side is grooved to capture juices for continuous basting while cooking. Linear-Flow valves with 180-degree Sensi-Touch control knobs give you the infinite heat control, allowing you to set your grill to the perfect temperature for searing, roasting or slow cooking. On either side of the cook box, you will find handy, stylish side shelves that are designed to quickly and easily fold down for convenient storage in tight spaces. The Sure-Lite™ electronic ignition offers you peace of mind knowing your barbecue grill will start quickly and easily. The below grills are all well constructed, with quality materials that will last and are proven choices for this price range. They all put a greater emphasis on quality than on features, though many feature great options as well. They all provide a great cooking performance and are an excellent value when considering price, quality, and performance. Weber Genesis E-330 Liquid Propane Gas Grill weighs in at 181 pounds with a 637-sq in total cooking area. It offers 38,000 BTU-per-hour input for the main burners with 12,000 BTU lidded side burner and a 10,000 BTU sear burner. The burners roar to life quickly and easily with individual electronic ignition modules at each burner. It comes with porcelain-coated cast-iron cooking grates and stainless steel burners, which are very durable. The high-powered sear burner is designed to step up the heat on demand for searing. The fixed side shelf is convenient for holding your grilling accessories. This gas grill helps take backyard barbecuing to the next level. 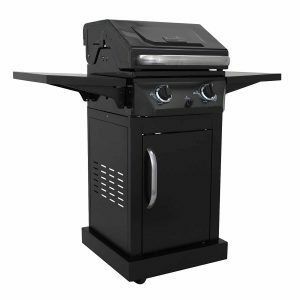 Napoleon LEX 485 Freestanding Propane Gas Grill weighs in at 175 pounds with a 637-sq in total cooking area. It offers 48,000 BTU-per-hour input for the main burners. The LEX485 also has a 13,500 BTU ceramic rear infrared burner for roasting and a 12,500 BTU ceramic infrared side (sear) burner. This 29 1/2-inch grill on cart has 485 square inches of main cooking area and 190 square inches of warming area for a total of 675 square inches of cooking area. The Napoleon electronic Jetfire ignition with crossover lighting starts each burner individually for a reliable start up every time and allows you to light all the burners at the same time. The stainless steel, self-cleaning sear plates vaporize drippings, control flare ups and keep your food moist. The tightly sealed, double-walled hood features an Accu-Probe temperature gauge and retains heat for oven-like performance. Backlit control knobs make grilling at night easy and cleanup is a cinch with the full-width removable drip pan. Napoleon P500 Prestige Propane Gas Grill weighs in at 191 pounds with a 760-sq in total cooking area. 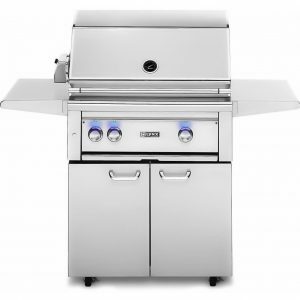 The Napoleon Prestige 500 propane gas grill has four stainless steel tube burners that provide up to 48,000 BTUs of cooking power. The Prestige P500 also has an 18,000 BTU stainless steel rear infrared burner with smoker channel and rotisserie kit for roasting or smoking and a 14,000 infrared side burner for searing steaks. The Napoleon electronic Jetfire ignition with crossover lighting starts each burner individually for a reliable start up every time and allows you to light all the burners at the same time. The stainless steel wave cooking grids are reversible and create the trademark Napoleon sear lines. The stainless steel, self-cleaning sear plates vaporize drippings, control flare ups and keep your food moist. Weber Genesis II LX S-340 Liquid Propane Gas Grill weighs in at 208 pounds with a 760-sq in total cooking area. The Genesis II LX S-340 has three stainless steel tube burners that provide up to 43,500 BTUs of cooking power. It also has a 12,000 BTU side burner. Premium stainless steel rod cooking grates provide even heat distribution across the entire grilling surface. 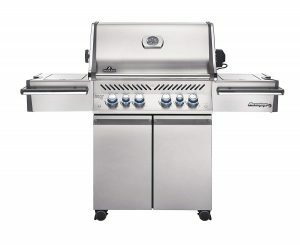 The GS4 grilling system is composed of four key components: The Infinity Ignition, High-Performance Burners, Flavorizer Bars, and Grease Management System. These components ensure that every aspect of your grilling experience is easy and reliable; from the moment the burners are lit to the general maintenance of your grill. And together, create the strongest grilling engine within this Genesis II LX grill. Broil King Imperial 490 Liquid Propane Gas Grill weighs in at 232 pounds with a 695-sq in total cooking area. The Broil King Imperial 490 has four stainless steel Dual-Tube burners that provide up to 50,000 BTUs of cooking power. It also has a 10,000 BTU side burner and a 15,000 BTU stainless steel rear rotisserie burner. The Imperial 490 features stainless steel cooking grids, stainless steel Flav-R-Wave cooking system, 4 stainless steel Dual-Tube burners, stainless steel side shelves with right side storage drawer and an enclosed cabinet base with stainless steel door and utility drawers. Built-in oven lights and a redesigned exterior on the Imperial series provides the best in both quality and looks. The below grills are all of excellent quality and construction, with quality materials that will last and are proven choices for this price range. They are all as close as you can get to ultra-high end professional-quality cooking performance, without spending over $5000. They are feature packed with stylish, modern designs with attention to detail. A premium gas grill is an investment that’s worth every dollar. I have to say, I am in love with a few of the grills on this list. 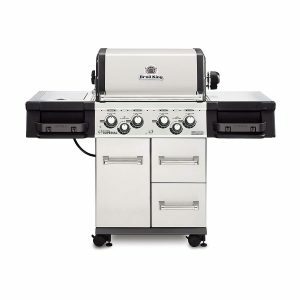 Napoleon Grills Prestige PRO 665 Propane Gas Grill weighs in at 228 pounds with an 1140-sq in total cooking area. The Napoleon Prestige PRO 665 freestanding gas grill has five stainless steel tube burners that provide up to 60,000 BTUs of cooking power. The Prestige PRO665 also has an 18,000 BTU stainless steel rear infrared burner for slow-roasting with the rotisserie kit. An integrated wood chip smoker tray pulls out for easy filling and has a dedicated 8,000 BTU burner that creates delicious smoke flavor. The SafetyGlow control knobs turn from blue to red when a burner is in use while two interior lights illuminate the grilling surface. The stainless steel grill cart features an integrated ice bucket, cutting board, side shelves and double doors for storage and easy-roll locking casters for moving the grill around. It also has internal and external grilling lights. 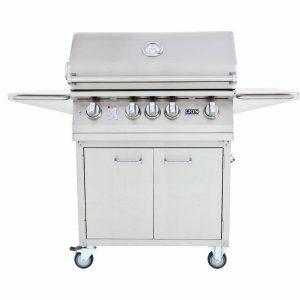 Blaze Professional 34-Inch 3-Burner Freestanding Propane Gas Grill weighs in at 315 pounds with a 615-sq in the main cooking area and a 201 square inch warming rack. The three commercial quality, cast stainless steel H-burners provide up to 18,000 BTUs each for a total of 54,000 BTUs to provide an effective cooking system. The heavy-duty 12mm hexagon, stainless steel cooking rods helps you achieve extraordinary searing temperatures and maximizes the durability of this grill. Slow-roast delicious meat or fruit using the 10,000 BTU infrared rear burner and included rotisserie kit with waterproof motor for grilling versatility, and when you are done, you can store the rotisserie rod behind the grill on the storage hooks. The stainless steel heat zone separators allow for different cooking zones across the grilling surface and help eliminate wasting heat and fuel. 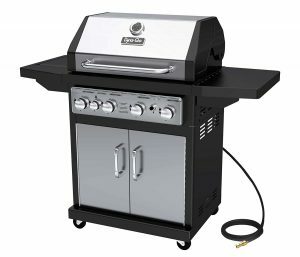 Lion 32-Inch Stainless Steel Freestanding Propane Gas Grill weighs in at 254 pounds with an 830-sq in total cooking area. Four cast stainless steel burners push 60,000 BTUs of cooking power, and a 15,000 BTU infrared rotisserie back burner adds fuel to the fire! Lite valves ensure a fast, steady flame for grilling startup, and push-to-turn knob design simplifies operation. The double layer, seamless welded, stainless steel grill head with polished edges delivers durability to your grilling area. An XL temperature gauge makes monitoring your meal simple, and the two interior lights illuminate the interior grilling area so you can enjoy grilling late into the evening. Premium solid stainless steel cooking grates resist wear and tear, and provide 647 square inches of grilling space. Napoleon Grills Prestige Pro 500 Propane Gas Grill weighs in at 221 pounds with a 760-sq in total cooking area. The Napoleon Prestige PRO 500 gas grill on cart has four stainless steel tube burners that provide up to 48,000 BTUs of cooking power. The Prestige PRO500 also has an 18,000 BTU stainless steel rear infrared burner with smoker channel for smoking or roasting with the rotisserie kit and a 14,000 BTU infrared side burner for searing meats. The Napoleon electronic Jetfire ignition with crossover lighting starts each burner individually for a reliable start up every time and allows you to light all the burners at the same time. The stainless steel wave cooking grids create the trademark Napoleon sear lines. The stainless steel, self-cleaning sear plates vaporize drippings, control flare ups and keep your food moist. The Night Light control knobs illuminate the control knobs and enhance evening entertaining while two interior lights illuminate the grilling surface. 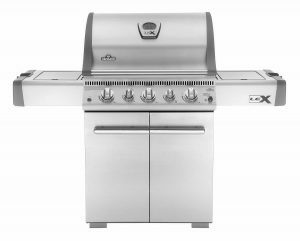 Lynx Professional 30-Inch Freestanding Propane Gas Grill comes with an 840-sq in total cooking area. Inside, a 23,000 BTU Lynx Trident ProSear adjustable infrared burner allows you to sear thick-cuts perfectly, or throttle back to cook more delicate items while a 25,000 BTU cast-brass burner delivers superior heat retention over tube burners so checking progress has minimal impact on cooking performance. The two burners push 48,000 BTUs of total cooking power on the grilling surface. An advanced ignition system uses a hot element positioned directly above the burner port for reliably safe start-up and a large-capacity smoker box allows you to add extraordinary flavor to all the things you like to grill. Over the burner, an array of fixed position ceramic briquettes ensures precise, even heat distribution. The Lynx L30PSFR-2-LP also has a dual-position internal rotisserie with heavy-duty, 3-speed motor and rear infrared burner to raise your cooking options to their full potential. Like to grill into the night? The adjustment knobs on the control panel sport blue LED accent lights for precise control and ultra-bright internal halogen lights illuminate the grilling surface eliminating guess work. This Lynx grill on cart serves as a complete mobile outdoor kitchen with two heavy duty swing-out cart doors, magnetic latches and condiment shelves that are removable for easy cleaning. 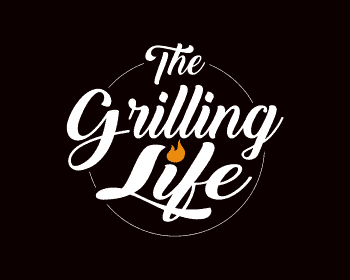 As always, if you or someone you know is in the market for a new LP gas grill or you find this information useful, please consider sharing it with your Grilling friends and on social media! Great article. So many choices though. Any opinion on the Blue Rhino GBC1273SP UniFlame? I see it recommended on a lot of sites. Thanks Guido. I have never had the opportunity to use the Blue Rhino GBC1273SP UniFlame myself but during my research, I have heard some good things about it. If I get the chance to use one in the near future, I will make sure to post a review so you can see a full update on my thoughts. Thanks for your in-depth review. I don’t own a grill yet but I’d love to. My friend actually just bought a house and he’d love to get a grill for his house. I’ll tell him to check out this review. Thanks again for sharing! I’m glad you found it helpful Kien. Hopefully, your friend does too. If you are he has any questions or I can help out in any way, please don’t hesitate to ask. There’s too many choices! lol Of course I’d love the Lynx Professional 30-Inch Freestanding Propane Gas Grill but it’s way too much, I think. Most of the time it’s only 2 or 3 of us, but once or twice a year we have family and friends get together and at that time I’d love to be able to cook a lot of things at once. Not sure what would be best. What grill do you think might be a good middle of the road for us? Yes, that grill is awesome. I wanted to add choices in several price ranges so people had a good idea what would be the best choices for them. Although most people will never own a luxury gas grill like some of the ones I wrote about, it is always nice to dream. 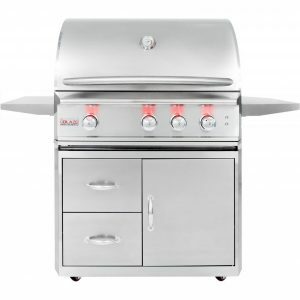 Without really knowing more of your needs and price range, I can only say that any of the grills I added in the Best Medium Priced Gas Grills list would make a good starting point. From there you can whittle down your choices based on size, options etc that will best fit your needs. Hope this helps. If you have any specific questions about any of the grills on this list, send me a message and I will be happy to help. thanks for sharing as this came just at the right time.My 5+-year-old grill is on its last leg, what with being dragged out each summer.Why summer? because that`s when I mostly grill. Thanks for covering different kinds of grills so one has a choice and selection, I sometimes feel a single product review does not do justice to a product leaving me no chance to compare. Hi Roamy and thanks for stopping by. I’m glad this was helpful to you and hope it has made your buying decision easier. Let me know if I can answer any questions or be of help in any way. Let us know when you decide to upgrade and tell us how you like it. This is a very detailed line-up you have here. I particularly like the features of the Napoleon P500RSIBPSS Prestige Liquid Propane Gas Grill. The commercial is quite comical as well lol. I like how this model has capabilities for smoking, searing, rotisserie and of course regular grilling. This is like an all in one food making machine I love it. Do you know if this model comes with the lighting for night cooking that is shown in the youtube video? I’m not too much of a night owl but you never know when I may want a midnight snack lol! Thanks in advance and wow what an article Patrick it looks as though you put your heart and soul into this one buddy! Thanks as always for stopping by David. And you noticed my favorite grill. The Napoleon P500RSIBPSS Prestige Liquid Propane Gas Grill is an amazing gas grilling system and you are right, they even have cool commercials. This grill does, in fact, come with the lighting features that are shown in the video. One more reason to want this awesome cooking machine. Patrick, in my family we’ve always been partial to a goood old grilled meal, but having seen the fuss and smell (lovely smell, but not on your clothes!) it causes when invited to other people’s gatherings, we’ve never contemplated the idea. Not, that is, until we moved to our new house some two years ago. Last year we were still busy getting sorted and settled, but this year I have started suggesting to my husband possibly getting a grill ourselves, as we have a bigger garden, and we could use it at the bottom where it would be far from our windows and the ones of neighbours. We would not use it regularly, nor for too many people at a time. But, what would still concern me is a couple of issues: propane, how safe is it? And also (and that’s me being lazy, but I know the job would fall on me) how easy are the models you suggest to clean? Hi Giulia. You asked a very good question. It is important to understand that everybody should take precautions when using gas grills to avoid the health dangers or fires. This means always grilling in a well-ventilated area and checking hoses and valves on occasion for leaks. When defective, gas grills can cause fires. If inhaled directly, Propane gas can cause symptoms like nausea and headaches and at high enough levels, it can be deadly. Propane is safe though when the grill is operating properly. Propane is a colorless, flavorless and odorless substance. When used properly, gas grills can provide a good source of energy for cooking. As far as cleanup goes, Gas grills are much easier to clean than a charcoal grill. Most of the time it is as simple as brushing the grates clean after each use. Let me know if I can help further. Thank you for sharing. It has been very helpful in most part due my circumstance. I have a Char broil and it is getting to its last days. Lot of rust, even a burner fell due to the rust. I live in Costa Rica, a very humid tropical country and now I’m looking forward to get me another grill. I’ve been looking in the local market and beside of the Char Broil, there is Weber and Napoleon. Both are expensive here and well, I would hope that my next investment could live longer than only 4 years of my last grill. I’ve been doing homework by searching around in forums and reviews and apparently Weber wins in the long run versus the Napoleon. However, most of the reviews and publications I checked doesn’t have a published date, so, it might be 2017 or it could be 2007, who knows!? So, I’m reaching out for your feedback in terms of grill longevity. Obviously, I have the cleaning tools, I always use none abrassive cleaning liquids and I always use a cover for my grill. Rain can pour seriously down here. Thanks for your reply and cheers! Hi Ricardo and I hope you are enjoying the holidays. Sorry for the late reply but I was traveling with the family during Christmas. Getting a new grill is always exciting so congratulations. I’ve used Weber’s for years and they’ve all lasted a long time when properly taken care of. I can’t personally vouch for the longevity of the Napoleon as I have only used one for about a year, but they have a good reputation and I hear many good things about them. All my contacts I have reached out to ultimately suggest going with the Weber for longevity. And they way you describe taking care of your grill, I think you will be set for many years to come.